Leverage contests and giveaways with influencers to drive social engagement, email signups, sales leads, and grow your social audience. The holy grail for many marketing today is viral content. But achieving viral content at scale for your brand is not always easily achieved. It requires that brands engage audiences to participate in the social conversation and share their message with their followers, creating the potential for expotential growth and audience reach. Giveaways can be a great way to build massive brand exposure. When a giveaway is done correctly, it can drive traffic to your website, bring more readers to your blog, help convert visitors into customers, or increase your revenues exponentially. But therein lies the question: How will I get people to know I have a giveaway if they don’t even know about my brand? Snips Social Sweeps is a platform designed for brands to foster social engagement, drive feedback on products and services, or learn more about consumer behaviors. Through Social Sweeps, brands can create surveys or signup forms quickly and easily. Use these surveys to drive sales leads, email signups, and grow your social fan base. Once your sweepstakes ends, you can choose a winner with a single click, and download all your data in an easy exportable format. Whether you're a blogger, small business, or a large brand, reaching maximum exposure is most important. Brands leverage Social Sweeps giveways to increase audience reach organically, and to engage audiences in creating original content about their brand. Social Sweeps helps you achieve virality with each signup that reshares the giveaway, and through influencers who amplify your audience reach with their followers. Everyone wins! Snips provides a seamless experience across all devices and platforms through our hosted Social Sweeps landing page that not only looks great, but allows you to syndicate your contest in a way that fits the image of your brand perfectly. You can embed your campaign in your own site, share on social media, or run your campaign through our influencer network to amplify your reach. With real-time analytics, you can view a breakdown of unique engagements across all social media and online platforms. Social Sweeps is simply the most cost-effective way to grow your audience and acquire intelligible data about your consumers. There are no monthly fees — you simply pay for real, quantifiable results on a cost-per-engagement (CPE) model. Running a competition or giveaway has never been easier now that you have the power of Snips at your fingertips. 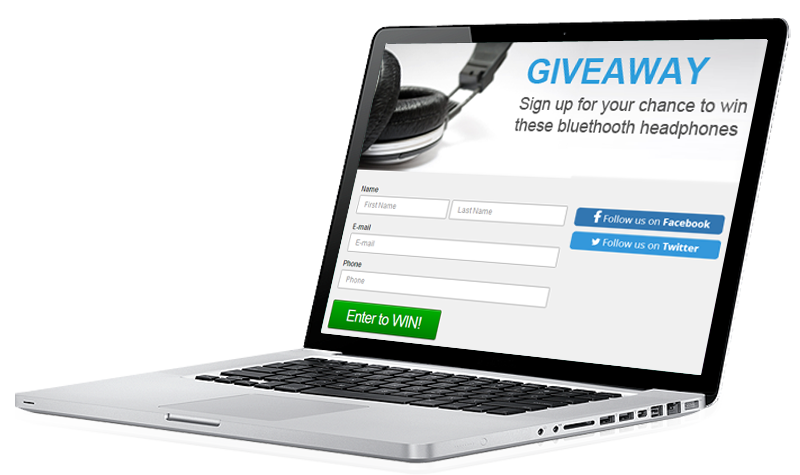 Social Sweeps campaigns are surveys, signups, or contests that are driven by giveaways. Influencers snip and share the link to the Social Sweeps campaign, additionally adding their own message or voice to the post. When followers click on the snipped link, they are taken directly to the Social Sweeps landing page. How is Social Sweeps different than other giveaway or sweepstakes sites? Social Sweeps is designed to run seamlessly on any platform or device. It can be posted on any social media, like Facebook, Twitter, LinkedIn, or Pinterest, appearing as native content. But the greatest value is the Snips network of influencers who will share your campaign with their audiences to drive virality. How am I charged for campaigns? Social Sweeps campaigns operate on a cost-per-engagement (CPE) model. Only unique acquisitions are counted per the entire campaign period. You can set a budget cap or time limit for the campaign. Can I specify targeting parameters for my campaign? You can only limit your campaigns to specific countries. Can I choose Influencers for my Social Sweeps campaign? You cannot select individual influencers for your campaign. However, you may specify preferred influencers by category and age range, which helps in promoting your campaigns to the right groups of influencers.